The first general elections in independent India the Congress fought without Jawaharlal Nehru’s leadership, in 1967, led to the party’s defeat. The party faced a robust challenge from a set of outfits that existed in the political space ever since the first general elections – from October 1951 to March 1952. The Swatantra Party, however, was not part of this political axis. Current political processes underway revive memories of the grand coalition of forces primed against the Congress party, under the leadership of Ram Manohar Lohia. Ahead of the 2019 general elections, a similar attempt to forge a broad coalition is in the making. However, this time, the forces are primed against the BJP. Two issues dominate the current political discourse. First, are Lohia’s politics of anti-Congressism nearing their end? Second, will the current anti-BJP coalition efforts meet the same fate as the 1989 and 1996 experiments? In 1989, the coalition depended on the BJP for its survival. In 1996, the Congress supported a third-front-led coalition government. Both regimes collapsed swiftly. There are similarities as well as distinctions between past and present political processes, which hold important lessons for the future. Both the 1989 and 1996 experiments were responses to a concrete political reality. Equally, they were manifestations of an anti-Congress opposition unity that Lohia can be credited with crafting back in 1967. However, it is best to clarify at the outset, that even while getting all the anti-Congress forces together ahead of 1967, Lohia was the only one who perceived it as the beginning of a political project. None of the other participating forces necessarily agreed with his line of thinking. Locating today’s concerns as well as those of the past – when Lohia set the stage in 1967 – in the losses suffered by the Congress in nine states is important. Casting a brief look at the 1962 general elections and the events they set off would be relevant in this context. It is important to stress that the 1967 outcome was, perhaps, the culmination of a trend that began in 1962. The trend was mediated by a set of developments in the the socio-political domain between the third and fourth general elections in 1962 and 1967 respectively. 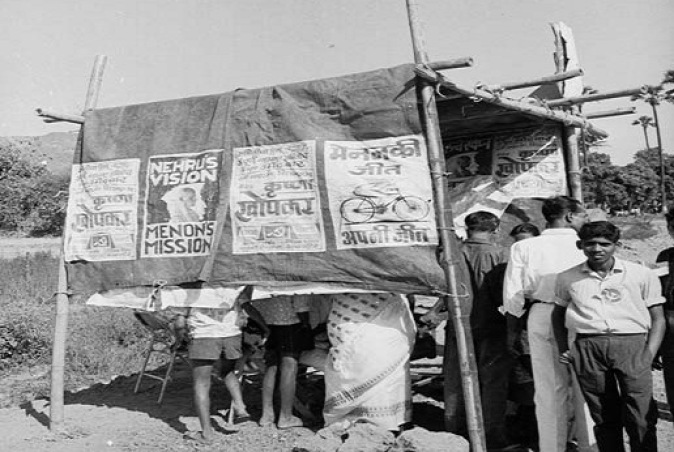 Apart from the fledgling Swatantra Party’s gains, the general election results of 1962 suggested that the Congress party, even with Jawaharlal Nehru as its leader, had become vulnerable. The party’s votes plummeted by four percentage points from its 1957 share, marginally less than its share in 1951-52. From 45% in 1951-52, Congress’s votes went up to 47.8 % in 1957 and again fell to 44.7 % in 1962. Though the Swatantra Party stunned everyone by securing 7.9% of the votes polled, the Bharatiya Jan Sangh, too, gained by winning 14 Lok Sabha seats (ten more than its score in 1957), with a marginal 5.9% to 6.4% vote share increase. Dravida Munnetra Kazhagam was yet another party which gained in 1962, winning seven Lok Sabha seats. The socialists, despite internecine wars and the many splits and mergers during the decade after 1951-52, managed to retain their strength in the Lok Sabha, with a tally of 18 seats. Let’s consider the mismatch between the small gains and losses in terms of vote share percentages and the number of seats won and lost by parties. The vote share in percentage points represents the national average and, hence, does not reflect regional variation. Disaggregated data for the various states, meanwhile, helps understanding this; and foregrounding the social and the economic factors is essential in this exercise. This involves understanding the interactive processes between caste, economics and politics. The Swatantra Party gained predominantly in Rajasthan and Orissa – states emerging from princely states and merging into the republic without using force. The Bharatiya Jan Sangh, too, gained in these parts. The socialists, meanwhile, gained strength in regions where the overlap between caste and class was fundamental to peasant movements alongside the freedom struggle – eastern Uttar Pradesh and northern Bihar in general. The DMK, meanwhile, established itself as a force by combining the legacy of social reforms and linguistic identity in India’s nation-making project. This was distinct from the western European experience – France, England, etc. – where nations were founded on shared linguistic identity. Subsequently, we witness the unravelling of contradictions challenging the discourse of ‘nation’ and ‘nationalism’ during the 1920s. Theorised by V.D. Savarkar and K.B. Hedgewar, cultural nationalism led to the inception of the Bharatiya Jan Sangh. As communists mobilised workers and peasants in industrial towns and the countryside, linguistic identities asserted themselves within the Indian National Congress in the 1920s. The other challenge – the aspirations of depressed classes, sparked by B.R. Ambedkar – was yet to come to the fore in 1967. The translation of Ambedkar’s idea into a political project – namely Dalit politics, which was absent in 1967 and nebulous in 1989 and 1996 – is now pivotal to an opposition-led coalition against the BJP. We must, then, dismiss the skewed notion that history repeats itself. Events in history, on the contrary, unfold and take shape in response to concrete realities. It is, hence, important to register that lynch mobs and the angst to preserve the cow and prevent its slaughter did not merely affect the political behaviour of the Muslim minority. Such violence has also affected a large chunk of people belonging to Scheduled Castes, who also consume beef. Coming at a cheaper cost, beef provides protein in their diet. At a broader level of economics, the Dalit community is engaged in skinning dead animals for their hide. The incident of flogging Dalits in Gujarat’s Una marked a new beginning in Dalit politics. There was another set of factors which influenced the 1967 poll outcome. India’s defeat in the war against China in October 1962, the back-to-back failure of monsoons and the consequent drought and famine situation in Bihar, and the food shortages considerably upset the third economic plan. Nehru’s death on May 28, 1964 set the stage for the Congress party’s reverses in 1967. However, the tide had started turning against the Congress even prior to that. The May 1963 by-elections from Farukhabad and Amroha in Uttar Pradesh and Rajkot in Gujarat were won respectively by Lohia, J.B. Kripalani and Minoo Masani. As a result, Lohia accelerated his efforts to gather the entire opposition against Nehru and his party. The motion was defeated. But Lohia kept up his efforts to unite the opposition, and the Praja Socialist Party merged with Lohia’s Socialist Party to form the Samyukta Socialist Party in June 1964. Yet, rather than opening up the next stage of forging unity with others in the opposition, the SSP ended up splitting once again in February 1965.